How Will the International Space Station Fall to Earth? If a dead bus-size satellite's crash-landing can cause such a stir, global panic may well ensue when it's time for the enormous International Space Station to come down to Earth. But that panic would be misplaced, NASA officials say. Though the orbiting lab is far larger than the space agency's defunct Upper Atmosphere Research Satellite (UARS), which made an uncontrolled re-entry through Earth's atmosphere late Friday night (Sept. 23), the station's eventual demise will pose little threat to folks on Earth. "We've done a lot of studies," said Kirk Shireman, deputy manager of NASA's space station program. "We have found an orbit and a change in velocity that we believe is achievable, and it creates a debris footprint that’s all in water in an unpopulated area." Judging by its size, the International Space Station would seem to pose a much bigger threat to folks on the ground than the UARS satellite did. The $100 billion orbiting lab is as big as a football field and tips the scales at 431 tons, so its re-entry debris shower should dwarf that of UARS. NASA and its international partners plan to operate the space station through at least 2020, and perhaps until 2028 or so. But when the orbiting lab's time is up, managers won't just let it drift toward an uncontrolled re-entry. Rather, they'll guide the complex to a fiery death over large stretches of trackless ocean, so that any surviving pieces will not conk anybody on the head. "We've been working on plans and update the plans periodically," Shireman told SPACE.com. "We don’t want to ever be in a position where we couldn’t safely deorbit the station. It's been a part of the program from the very beginning." Bringing the space station down is a long and involved process that will begin in earnest about one year from its planned re-entry, NASA officials have said. Around this time, managers will let the station's orbit start decaying from its normal 240-mile (386-kilometer) altitude. They'll also dock one or more unmanned spacecraft to the station then, to get ready for future deorbit burns. The station is so massive that it'll need some help to make these maneuvers. Officials aren't sure yet which vehicle(s) will be called into service, Shireman said. It might be a cargo craft, such as a modified Russian Progress spaceship or a European Automated Transfer Vehicle (ATV). NASA's Orion Multi-Purpose Crew Vehicle (MPCV), which is still in development, might also do the trick. Before the station circles too low, its crew will be evacuated. When the space station gets down to about 115 miles (186 km) above the Earth, engineers will perform a series of deorbit burns with the docked vehicle(s) to take it even lower, Shireman explained. "There's a nice long track from the South Pacific up off the West Coast of the United States, almost 6,000 kilometers of water," Shireman said. 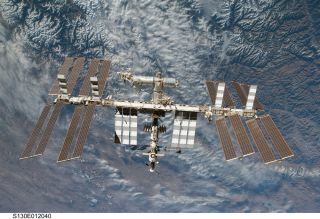 The Russian space station Mir was deorbited purposefully back in 2001; operators ditched the 135-ton station into the South Pacific. NASA officials watched Mir's managed re-entry carefully and learned from it, Shireman said. NASA has also closely examined how spacecraft break up in Earth's atmosphere. For example, two robotic space station resupply craft — one European ATV and one Japanese H-2 Transfer Vehicle (HTV) — were loaded up with instruments, then studied as they made their fiery descents through the atmosphere and disintegrated. "All those things will help us better pinpoint how [the space station] will break up and, consequently, where the debris will fall," Shireman said. So hopefully none of that debris will endanger anyone when the massive complex falls to Earth in 2020 or beyond. But if you happen to be on a well-placed boat in the vast Pacific when the station does come down, be sure to look up, as the descending outpost could put on quite a show for interested skywatchers. "It would be amazing if they saw it," Shireman said. But, he added, "it would be just blind luck, because we can't predict where it's going to be and exactly when." SPACE.com Senior Writer Clara Moskowitz contributed to this story. You can follow SPACE.com senior writer Mike Wall on Twitter: @michaeldwall. Follow SPACE.com for the latest in space science and exploration news on Twitter @Spacedotcom and on Facebook.